Affordable Kapaa Vacation Rental In Paradise! If you are planning a trip to Kauai, Hawaii and are looking for a vacation rental condo, no need to look any farther! Wailua Hideaway apartment with full amenities like washer/dryer and BBQ grill is better than a Kapaa condo and is the perfect place to call home while you are on the island. Our vacation rental is perfectly located for exploring Kauai island. 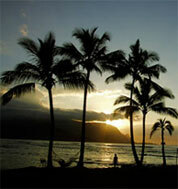 Located in Kapaa Kauai, it is in the middle of all the attractions and activities. Wailua Hideaway is only minutes from the Lihue airport. Within minutes you could be at the Wailua beach, several waterfalls, shopping or experiencing the many wonders of Kauai. Wailua Hideaway is a private one bedroom luxury apartment located in the quiet and secluded Wailua Homestead neighborhood on Kauai’s east shore. Our vacation rental is fully self contained and properly appointed for a comfortable stay while vacationing in Kauai. Small families, Honeymooners, and couples have all enjoyed the comfort and the private atmosphere of Wailua Hideaway. If avoiding the crowds and commotion of a stay at a resort is one of your desires in a vacation rental we promise you will find our apartment a terrific value. Contact us by e-mail or give us a call and find out why so many of our vacationers call Wailua Hideaway their “Home Away From Home”. Please come and enjoy our hospitality. “Dear Lynda & David, where do I start? It is with such mixed emotions I write this. We’re so happy to have shared your home – vacation rental in Kauai this past month, your corner of paradise. The thing we found most enjoyable on this trip was the gift of your friendship. “Dear Lynda & David, mahalo for letting our family be your first guests. Our two weeks were wonderful. Your home is beautiful and you did a great job of having everything we could possibly need”.